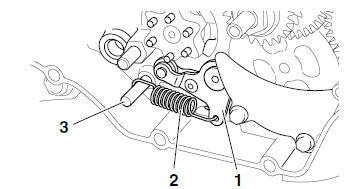 Install the stopper lever spring as shown in the illustration. Hook the ends of the stopper lever spring onto the stopper lever and the crankcase boss "3". Mesh the stopper lever with the shift drum segment assembly. Hook the end of the shift shaft spring onto the shift shaft spring stopper "2".